When it comes to your children, you are like all parents in the sense that their well-being is more important than your own. So for optimal eye care, don’t go to just any eye doctor. At the practice of Christianne Schoedel M.D., you can be confident in getting the attention of a pediatric ophthalmologist; a medical doctor who has the expertise and experience to ensure your peace of mind that your precious child’s vision and eyes are in the best possible care. Our Hershey pediatric eye doctor is approaching two full decades in the service of treating children’s eyes. 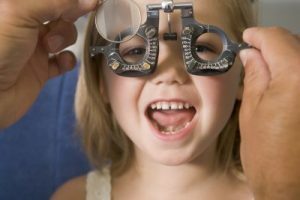 Get out ahead of common childhood eye ailments, as well as making certain that your child is experiencing the best vision that he or she is capable of. Before your child begins school, it’s important to bring her or him in for a complete examination. Many times, children need corrective eyewear, but neither they nor their parents are aware of it. And with improved vision, your child’s performance in school may become much more effective. Social interactions, sports, using a computer, there are few things you can name that are not enhanced by having better vision. Pediatric eye conditions, such as strabismus, amblyopia, and color blindness are also checked for as part of a routine exam. The sooner such problems are detected, the better the chances of positive outcomes. Our Hershey pediatric eye doctor goes even further, though, diagnosing and treating a range of issues from blocked tear ducts to the ocular effects of juvenile rheumatoid arthritis. Diabetic eye exams are also conducted. It’s fair to say that regarding your child’s eyes, you will feel at ease knowing that you have our Hershey pediatric eye doctor on your side. Whether you want to schedule a regular eye exam or have a concern checked out, simply reach out to our office to arrange an appointment.